Anyway, enough about my life and how hectic I feel it is, let’s talk about this week’s design. It’s a necklace! I’m sure you got that already 😀 I love chevrons and sadly I don’t design with them as much as I’d like. This week’s design is actually an older necklace design I made YEARS ago that I updated to look better. It’s one of those designs that I’ve wanted to work on, update, and see how far I’ve progressed as a designer but didn’t find the time for until recently. It’s a quick pattern, you can get it done in one evening and then let your two chevrons dry before assembling the whole thing. 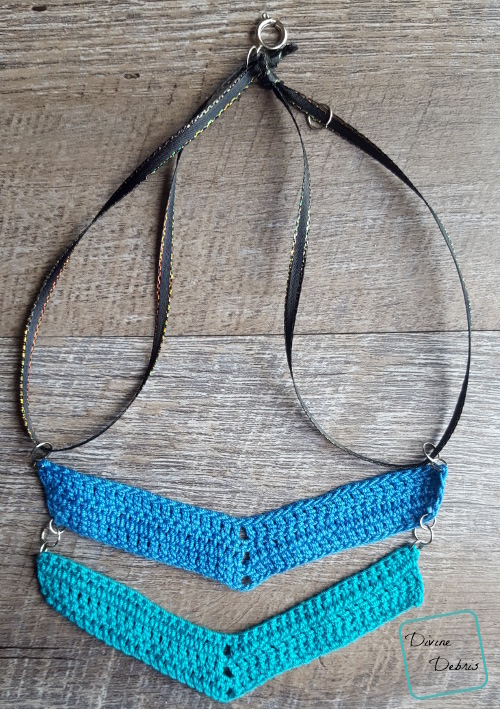 This design makes a fun and quick gift and it’s a great option for Summer crochet items. 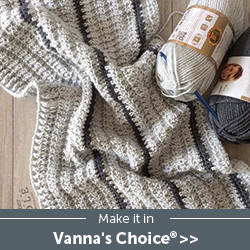 It’s also a great refresher, like a palette cleanser when you’ve got a few different and large projects on your hook and you want something small and quick you can finish. As with some of my other jewelry designs, this one has many more photos than I usually include to help you see what’s going on. Jewelry making is so small that I like to give you as many photos as possible. I really hope you like this design and I hope you give a few away to lucky people. And please, share your photos on social media and tag Divine Debris or use the hashtag #divinedebris on Instagram so I can find your lovely works! 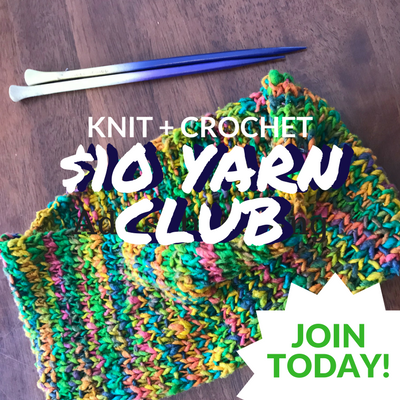 You can purchase an ad-free pdf of this pattern in my Ravelry shop. 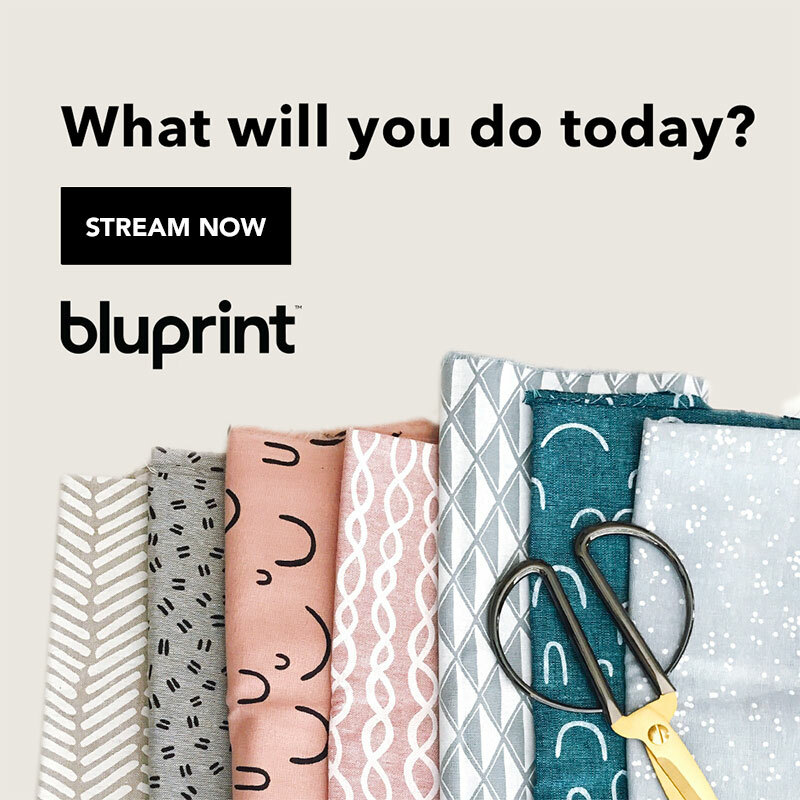 This purchase helps me to make patterns week after week. 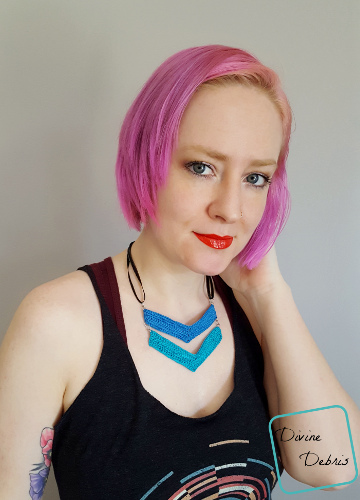 A huge thank you to Meghan B. for becoming my newest patron on Patreon! Learn how you can become a patron here. The individual chevrons are worked back and forth in rows, separately. When you complete the two chevrons, block/ stiffen them with fabric stiffener. Once they’re dry, attach them with metal findings. 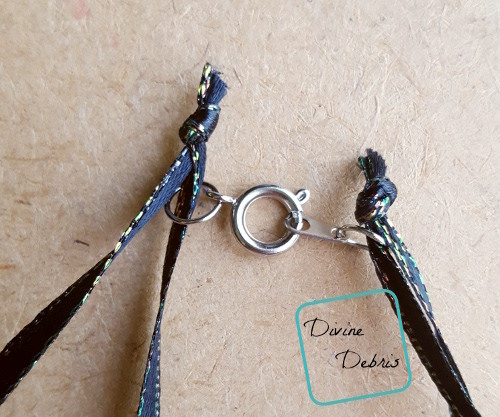 You can use a chain or cord or even more thread for the straps, it’s totally up to you. There are 2 chevrons in the photos. You can do more or fewer, it’s up to you. The colors used here are Blue Hawaii and Peacock. This necklace is just made of very simple chevrons. 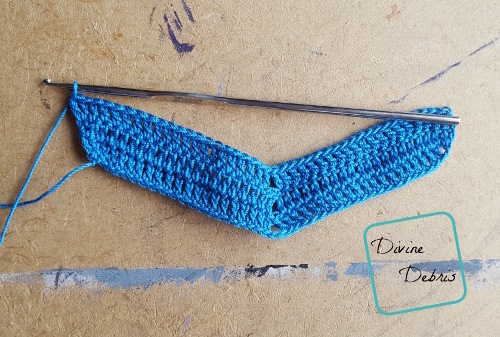 Once you have both of your chevrons completed lay them flat and cover them in fabric stiffener and then let them dry completely. You can lay them out with pins on a blocking mat so the design stretches out and you can control where the points are. 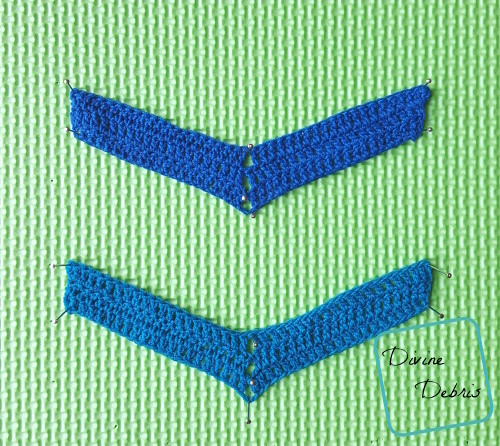 Once your chevrons are dry, add some jump rings to connect the two chevrons. I like to do 2 small one and one large in the middle but it’s up to you how you’d like them to be attached. Cut 2 pieces of ribbon (or make a log chain or cord or whatever material you’d like to use). I cut my pieces 12″ in length but you can make yours shorter or longer, this will determine where the necklace falls on your decolletage. On the points of the chevron, attach 2 more jump rings and then run one of your pieces through the top one. Tie a small knot at the top. 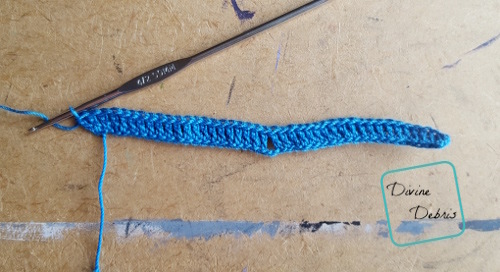 You can glue the two ends together or however you’d like to secure them. 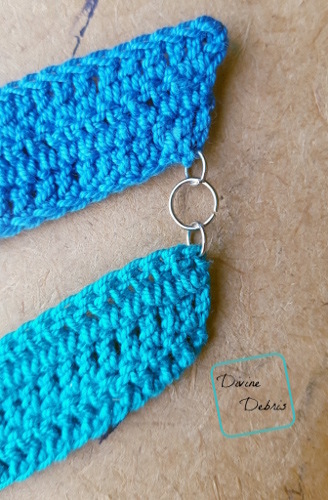 Add a clasp of your choosing to the two ends of your ribbon. And you’re done! 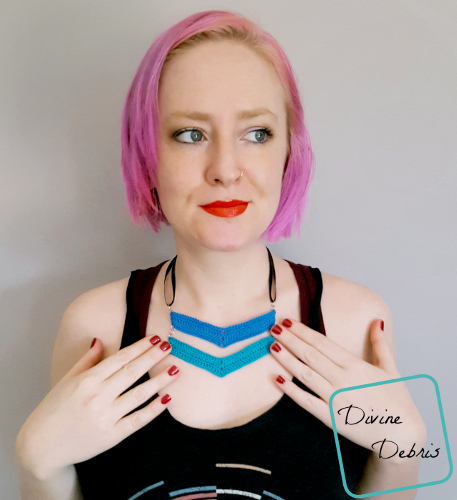 Now your handmade chevron necklace is done and you look awesome. Tada! There’s what I hope will be one of your favorite new accessories!